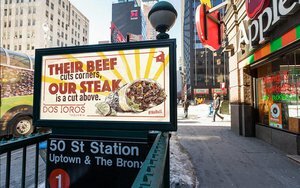 New York-based taqueria Dos Toros is riffing on Chipotle's food safety issues with its first-ever ad campaign. Developed with its agency BigEyedWish, the #NoBull campaign plays on the company's name while also touting its focus on being transparent with its customers about ingredients, pricing and food preparation. The headlines also allude -- without naming names -- to the fact that the restaurant chain's main competitor might not be as transparent. One ad, for instance, states: “Their beef cuts corners, our steak is a cut above” and another one says: "They use rice cookers, we are rice cookers." The first phase of the campaign features out-of-home signage that appears throughout Manhattan and Brooklyn in subway stations, subway cars and bus shelters. The social media component will roll out at a later date. This launch of the #NoBull campaign comes at a time of major expansion for the chain, which plans to open 15-20 new locations in the next three years, including in new cities such as Chicago and Boston. Currently there are 10 locations in New York, with two additional locations opening this summer in Midtown -- one directly across the street from a Chipotle. "Until now we’ve been so focused on our team and our food quality that we've overlooked telling the story of our truly scratch cooking done with fresh and high quality ingredients," stated Leo Kremer, co-founder, Dos Toros. "The #NoBull campaign conveys our commitment to transparency in a way that feels playful and totally authentic to us."